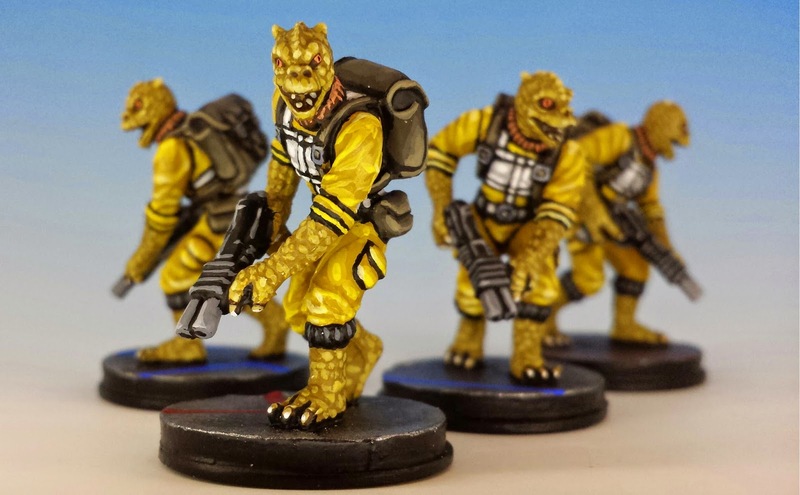 Since I started painting the Star Wars Miniatures from Imperial Assault, I've tried to adjust my painting style. My normal approach involves lots of rust effects, stains, and acne... something that fits in well with the earthy and run-down atmosphere of Warhammer. But my image of Star Wars is not like that at all. There is nothing run-down about Star Wars. So I've tried to make my paint jobs clean and crisp: simple colours, bleached whites, no dirt. In order to capture the highly polished surfaces, I've largely abandoned metallic paints (which have a limited dynamic range). Instead I'm using whites and light greys to mimic light effects. 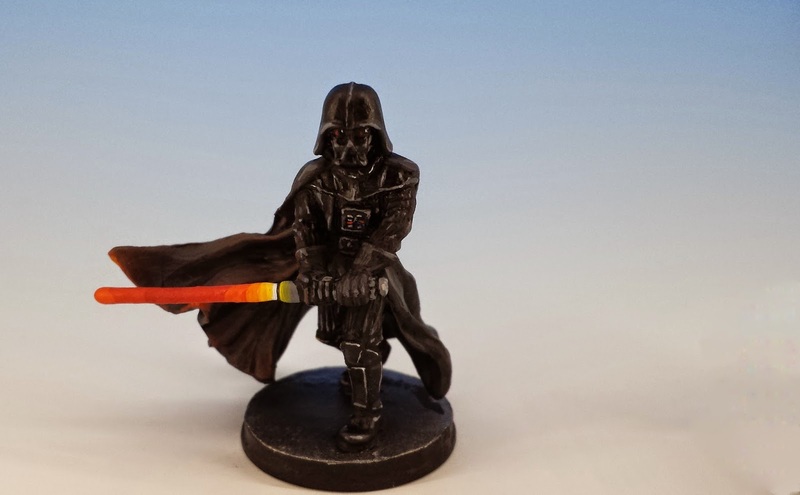 (This approach is probably best seen in the figure of Darth Vader below.) A superb example of this simplistic style of miniature painting is a Jedi diorama painted by Florian Tuffskull - his work nails the monochromatic (but dramatic) feel of Star Wars. I thought long and hard about how to base these miniatures. Like most hobbyists, my natural inclination is for a lush base. But the action in Imperial Assault mainly occurs inside spacecraft, military bases and bunkers. 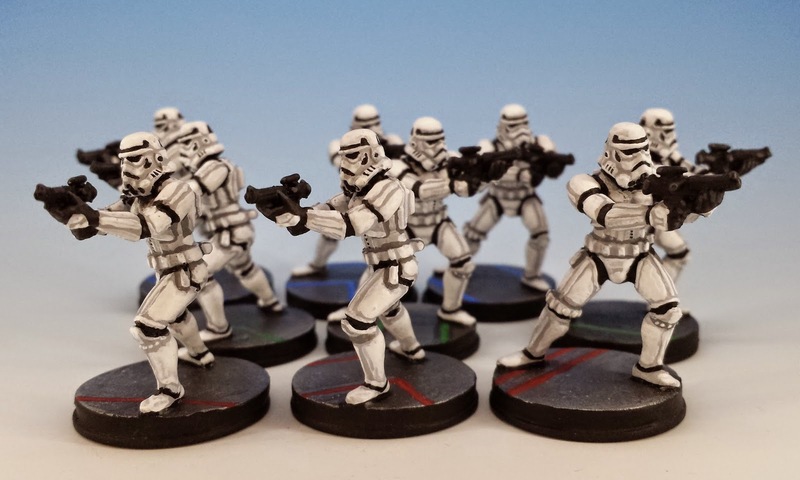 I decided to hold fast to the clinical aesthetic of Star Wars and use a simple, polished metal floor (in fact, the bases are the only metallic paints in these miniatures). 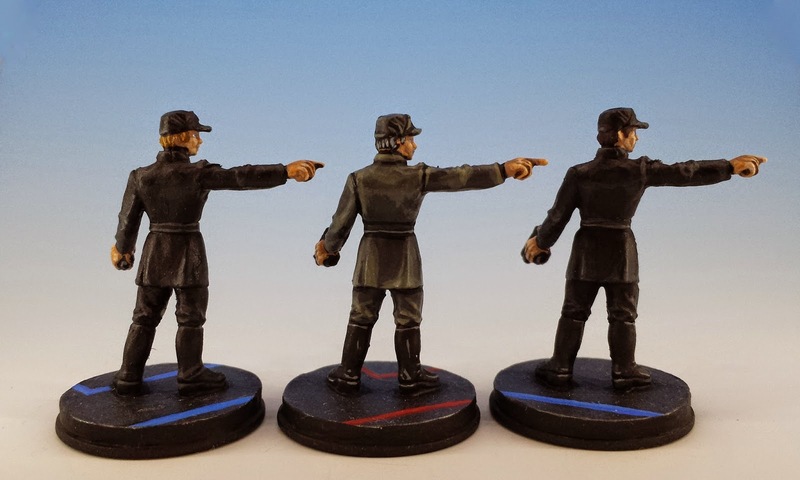 In order to add a little interest and to help distinguish between different squads of miniatures, I painted simple traffic stripes on the bases in blue and red. Another unique characteristic of Star Wars are the uniformly black mat guns. I find them quite menacing in the movies, and they create a great contrast with the white Storm Trooper armour. But they pose a challenge for the painter, since flat black can be quite boring. My approach has been to carefully highlight the weapons with gray - just enough so that the eye can pick up detail without losing the feeling of lethal gravity. 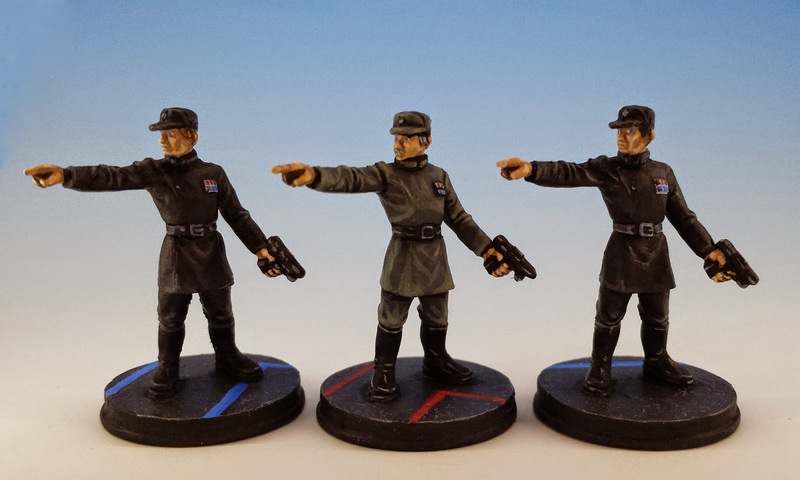 I've received some inquiries here and on Boardgame Geek about other painting techniques I've used, specifically about the Emperor's Guard. For the record, I didn't use any blending techniques or oil paints. 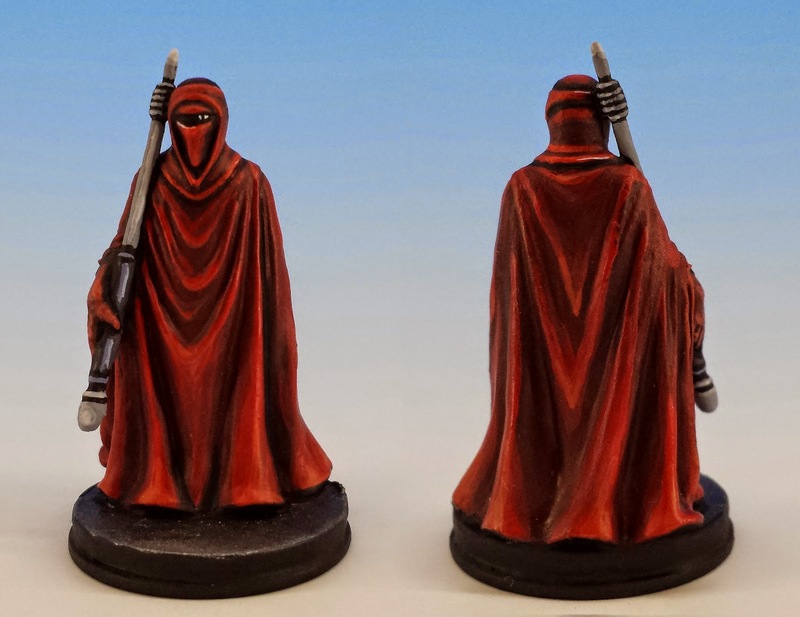 The red robes in these minis is simply the product of 6 or 7 graduated layers of Vallejo Game Colours. I primed the miniatures in white, and then slathered on a couple base-coats of Extraopaque Heavy Red mixed with a little black (approx. 4:1). I layered up with pure Heavy Red, and then increasingly bright mixes of Heavy Red and Gory Red, until I'm using pure Gory Red. Whenever painting red, the key is to avoid allowing it to become too orange in the final layers - so I didn't use a bright orange as the last highlight. Rather I applied thin lines of Parasite Brown (a warm brown) on the tips of the creases. I didn't employ any washes, although I did apply a few strokes of pure black in the deepest crevasses of the cloaks, to add a sense of drama. The helmets follow approximately the same technique, although I used a slightly different palette of red paints (Scarlett Red to Bloody Red) since I wanted to suggest (however subtly) that the helms are made of a different material than the robes. As the final highlight, I applied a few lines of light grey and white to show reflecting light. I hope this is helpful! Next week I'll discuss using oil paints on the Imperial AT-ST Walker. Wow, these are beautiful! Great work! You really got the Star Wars vibe, excellent work!! They all look fantastic Sul, as per your usual output. Thanks for the 'lush base' link, I am flattered. Amazing work, you've really captured the ethos of those early, clean Star Wars characters. Your layering/blending is really well executed too, very inspirational! 24_Cig... I can't wait until I get back to painting some Warhammer miniatures so I can try out your "cork" technique. For some reason, I seem to have a lot of loose corks around my house. 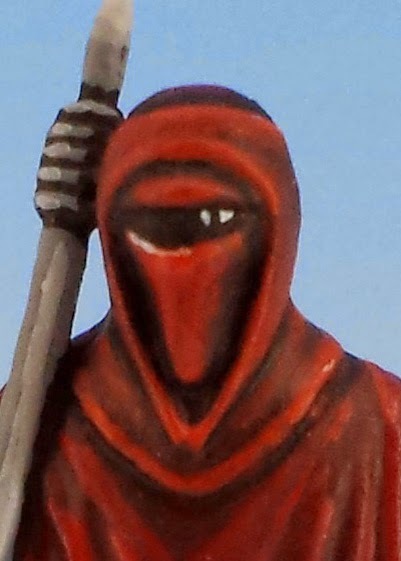 That's some remarkably nice red painting on the Emperor's Guard models!